Cindy Ladage is a freelance writer. She specializes in stories about collectors, mansions, museums, and interesting places. Cindy writes for antique tractor and toy magazines and has a travel blog "Traveling Adventures of a Farm Girl." She has co-written three children’s books with Jane Aumann and three fiction books on her own as well as a series of short stories. She lives with her husband who is an avid Graham Bradley collector and a farmer in central Illinois. They have three grown children and two grandchildren. Larry Gay developed a love for agriculture and a fascination for farm machinery while growing up on an Iowa farm. After receiving a degree in Agricultural Engineering, he worked for Deere & Company for 35 years as a product engineer in two factories and then as Manager of Engineering for the John Deere Merchandise Division. Since taking an early retirement, he started collecting information about tractors and the farm equipment industry. Larry used this collection of information to write four books about farm tractors that were published by the American Society of Agricultural and Biological Engineers. The four books are Farm Tractors 1975-1995, Farm Tractors 1995-2005, A Guide to Hart-Parr, Oliver, and White Farm Tractors 1901-1996, and A Guide to Ford, Fordson, and New Holland Tractors 1907-1999. 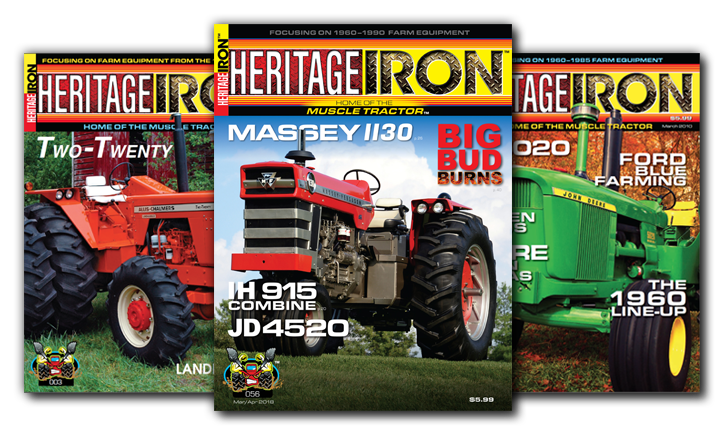 Larry has been writing the “Machinery Milestones” articles for Heritage Iron since Issue No.1. Larry and his wife, Margie, live on a small acreage near the Quad-Cities where his library of information continues to grow faster than his neighbors’ corn and soybeans. He may be contacted at larbook92@gmail.com. Jim Gay grew up on a farm in southeast Iowa. He Graduated from Iowa State University with a degree in Agricultural Engineering. He has worked for John Deere in Waterloo, Doerfer Consulting, Hawk-Bilt, and Chief Engineer at Mobility in Fargo, ND, and DMI. He spent 22 years of his 40-year engineering career at Engine Division of Caterpillar doing engine installations for Caterpillar and O. E. M. machines. He is a lifetime collector of ag and construction sales literature and has an extensive collection of farm, truck, and construction toys. Jim can be contacted at jegsbg@mtco.com. Tharran Gaines was born in north-central Kansas where he grew up on a small grain and livestock farm near the town of Kensington. He attended Kansas State University, where he received a degree in wildlife conservation and journalism. However, he began using his agricultural background as a technical writer for Hesston Corporation in 1974, and has been a writer for the past 43 years. As a technical writer, he has produced repair manuals, owner’s manuals, and assembly instructions for companies that include Hesston, Winnebago, Sundstrand and Kinze. Later, he moved to the editorial side of the business, where he worked for a couple of advertising/public relations agencies and a weekly farm publication. As a creative writer, he has crafted and produced everything from newsletter and feature articles to radio and TV commercials to video scripts and advertising copy for such companies as DeKalb Seed Company, DowElanco, Farmland Industries, Caterpillar, Challenger, Gleaner, Massey Ferguson and T-L Irrigation. In 1991, he began his own business as a freelance writer, and today continues to operate Gaines Communications with his wife, Barb, out of their home office in Savannah, Missouri. The majority of his business involves producing editorial and advertising copy for agricultural clients involved in the farm machinery industry. However, he has also written a number of books on tractor restoration and classic tractors, including some that are available through 3-Point Ink. Kenneth Updike was raised in Milton, WI. His many trips to his grandparents’ farm in his childhood started his interest in farm equipment. After obtaining a B.S. in Ag Engineering Technology, he began working at a dealership, eventually becoming Service Manager. At this same time he started writing articles for Red Power Magazine. He switched to the Parts Department and began in depth researching of the history of his farm equipment companies of interest: IH and Steiger Tractor. He has authored a number of tractor books covering the history of IH and Farmall tractors. His first book was a self-made (on a typewriter) IH tractor serial number book. His most recent book is the award winning “Red Tractors 1958-2013” book. Besides being a contributor to Heritage Iron magazine, he also contributes to Red Power and Classic Tractor magazines. Some of his hobbies include: collecting IH tractor & truck brochures and toys, Steiger tractor brochures and Kenworth truck brochures. He also enjoys restoring and collecting IH Cub Cadet garden tractors, restoring muscle tractors, O-gauge electric trains, and writing/reading history books. He enjoys writing/researching articles for Heritage Iron, as he gets to cover brands and topics that are not presented in other publications. Fred Hendricks owns SunShower Acres, Ltd. of Bucyrus, Ohio, a dairy cattle consulting business. Mr. Hendricks is also a freelance writer on subjects related to agriculture. He may be contacted at email: fwhendricks@gmail.com. Doug Nelson is an avowed tractor addict. But unlike most tractor addicts who fill up their garages, sheds, and barns with tractors, he fills up paper by drawing them. He says, “The good thing about my approach to collecting is I can have any make, model, and as many tractors as I want, which is nice.” His collecting got out of hand so he went as far as to get his wife Brenda's permission to quit his normal job and start up a small business drawing tractors called TRACTORS ink. He knows that's nuts, but figures “Hey, this is America… if you don't chase your crazy dream, what's the point of living here?" 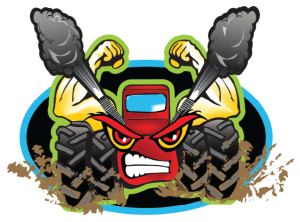 Currently he does three regular cartoons for tractor magazines and a bunch of custom work including logos, toy tractor box illustration, and muscle tractor sign art. His tractor work can be seen on his Facebook site (Tractors ink) and his website: www.tractorsink.com. Tyler Hall is a 4th generation tri-axle truck driver at his family's 102-year-old transportation business, W.L Hall Lime and Coal Inc. in Central Pennsylvania. With farming in the bloodlines on both sides of the family, he grew up in the heart of dairy country surrounded by the rolling hills and fertile fields. His love for operating and repairing all types of machinery was further refined through employment on a local family-owned dairy farm, and he has logged many hours in the cabs of tractors, trucks, large combines, and forage harvesters through the years. He enjoys studying and researching the machinery that was produced in the heart of the heritage era for the agricultural and trucking industries, and his special interest is researching the short-line manufacturers and lesser-known companies. Tyler is the author of one book entitled PERFORMANCE/ENDURANCE: The Machines and Men of Field Queen Incorporated, which is the only written history of the Field Queen forage harvester line. He resides in Loysburg with his wife Brittany, young son Dolan, and a collection of tractors that includes a Minneapolis-Moline G-1000 diesel, Ford 801 Diesel, and three Caterpillar D-2s.